I took last Thursday off to attend another class at the Bead Shop Nottingham. I felt really bad considering I'd gone home with a migraine on Tuesday, but if it was any consolation to anyone (it wasn't to me), I still had the headache. I've still got the headache now (I'm writing this on Sunday - I hope I don't still have the headache when this publishes, but I wouldn't be that surprised if I did). 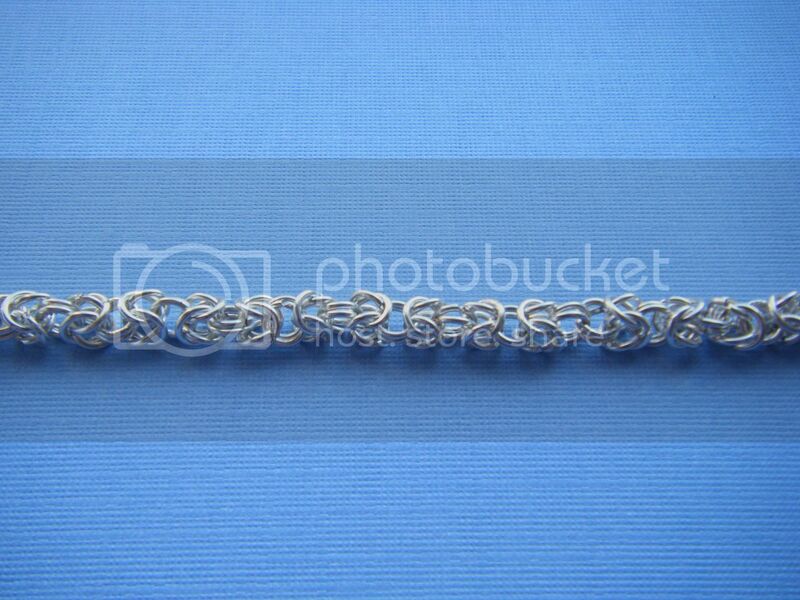 This time the class was chain maille. I've been wanting to try this for ages but it looked hard, fiddly and very time consuming. Fiddly it is, hard and time consuming it isn't. 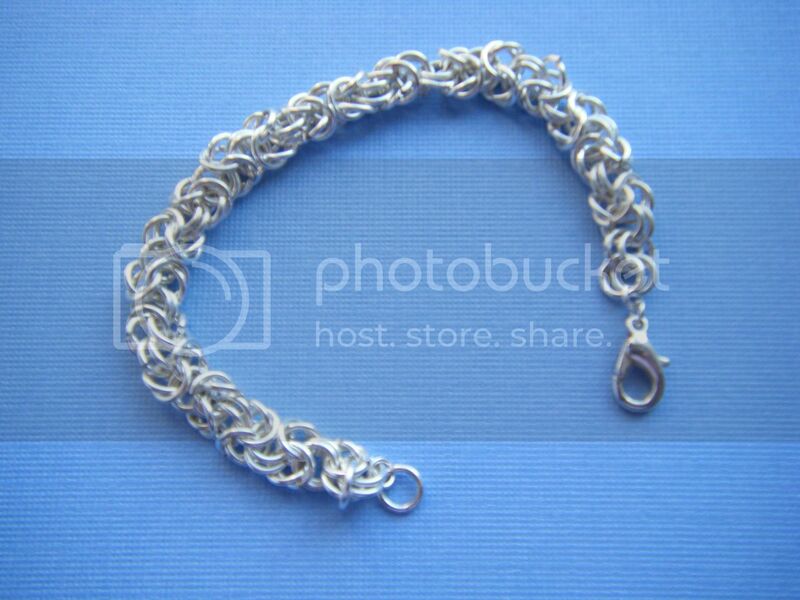 It took me about 2 and a half hours to make this bracelet, and that included making all the jump rings. 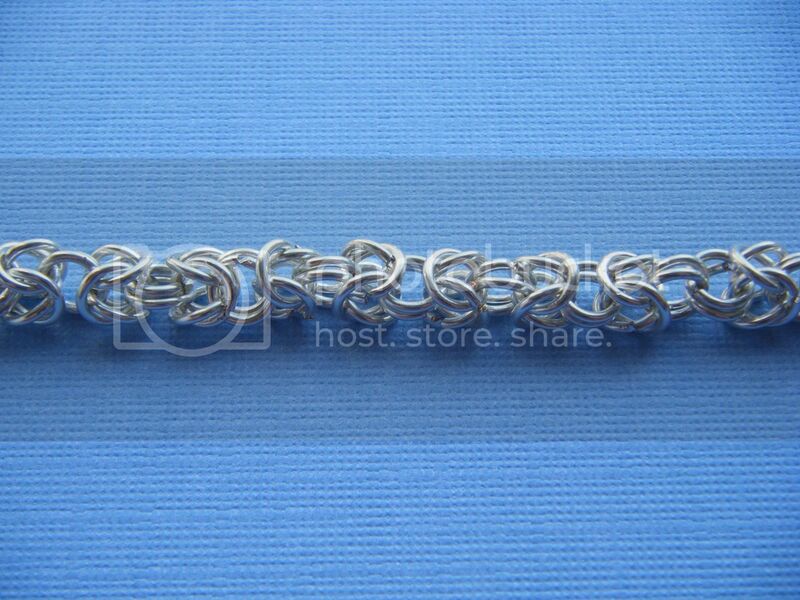 This is a Byzantine weave, a fairly basic one. It's fiddly at first but it does get pretty quick. Little equipment is needed. We used a jump ring maker in the class, but I'd use my coiling gizmo at home, some flush cutters to cut the rings and two pairs of chain nosed pliers (i.e. flat) to twist the rings open and shut. Oh, and a paper clip so you know which end to work on! I love it. I've been wearing it and it's so light. I'm not sure why that was a surprise, it wasn't heavy when I was making it! Yep, I'll be doing this again, perhaps with a few different weaves, I've already found a pattern in one of my many craft books! I'm linking up to Fiona's New to Me challenge. This is gorgeous! You should do some with some beads and sell them in your shop so I can buy one :) Rose quartz will do. It looks interesting. It's not something I'd thought of trying before. It might be nice to hang some charms off too. Struggling to get over the fact you made all the jump rings and it didn't take a year to do! The temptation to buy them would be too great for me. Looking good! I can't stand working with jump rings! it does look hard but really cool! I like it immensely! It would be a great detail to wear three or four together! It's really pretty! I've looked at taking a few classes to make something like this. I think it would be really nice with beads on it too! It does look fiddly and time consuming, I will take your word for it that it isn't!